Gwen Bortner is a Craft Yarn Council certified teacher, designer, and now is an author. In her biography, Gwen writes that she gave up her executive career as a head of an information technology group in Kansas City to devote her time to her lifelong passion for knitting and teaching. 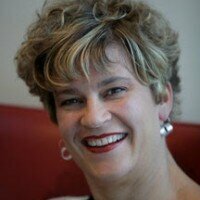 In 2002 she began her new role of a founder of Knitability, LLC. This company’ s motto of “Taking Knitters to the Next Level” is saying it all. Gwen likes to explore different knitting techniques and teaches them to her students firing them up with her enthusiasm. So, nobody was surprised that Gwen wrote a book on a very special technique called Entrelac that fascinates many knitters and sometimes brings anxiety to some. Gwen used this technique in many of her designs. Some of them you will see below. Her book is appropriately called “Entrée to Enterlac”. You got to see this book! It comes from a very experienced “biased” knitter and a teacher. Here are Gwen’s answers to The Designer’s Studio questions. My mother taught me when I was about 7. I knit one hat and then I was done – I knew how to knit! My next project was a sweater just before my senior year in high school. Apparently I was a knitter, because I was successful with my project with only a limited amount of help. Knitting really took hold in college including working in a yarn shop part time. My first published design was a result of my part-time job during college. I had discovered entrelac and starting playing with new and innovative ways to utilize the technique. My seamless entrelac sweater was published in Threads magazine in the early 90’s. But because I was focused on my information technology career, I did not officially publish anything until I founded my company, Knitability in the fall of 2002. Entrelac has always been the technique that I have been most intrigued with. 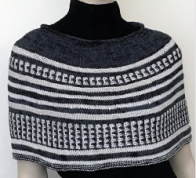 I often see a unique garment and think to myself, “I wonder if I could do that in entrelac?” That said, I really like playing with and exploring all sorts of different knitting techniques. That really is the fun of knitting – lots to learn, regardless of how much you think you may already know! When you are thinking about some new design, what inspires you the most? Is it different every time? Could you give us some examples on inspiration for some of your designs? Most of my designs are inspired by the need to create a project that demonstrates a technique or skill that I cover in one of my classes. Projects are a way to expand your knowledge and the finished object is just a really great bonus! So for me, it is usually about the technique. If I am designing for a magazine that has a theme, that also drives my design process. Rarely, do I start with the yarn, the yarn is just the medium for my creative expression. My studio is in transition as we are renovating one of the rooms in our house to be a shared office space for my husband and me. So right now it looks like a construction zone! However, I am hoping to be moved in before the end of the year. I am not sure that I have a favorite place. But where I do the most knitting is on the plane. I will have logged over 50,000 miles this year, so lots of my knitting time is in the air. The majority of the remaining time is sitting on the couch with my husband watching our favorite TV shows and DVDs. I have learned enough about spinning to appreciate the process, but recognized that I need to stay focused since this is my business. So the answer is “no”. I am traveling too much to really belong to a knitting group and honestly, I don’t have a local option. But I consider the other national level teachers that I see at many of the events to be my “knitting group”. We share ideas, ask each other questions and use one another as resources, so I think that qualifies. I am a member of AKD (Association of Knitwear Designers – www.knitwear-designers.org) which is how I stay in touch with other designers. I stay in touch with other teachers at the various events as I was stating above. I try to be fairly accessible to the knitting community via e-mail, phone (when I am in my office), at knitting events and I pop onto Ravelry (www.ravelry.com) fairly regularly. Entrelacqueen is my Ravelry name – I thought it was appropriate. My published designs are in many more places recently as I have been making a concerted effort to gain a broader awareness from the knitting public. Obviously, I publish through my own company, Knitability and I recently had my first book published by XRX, Inc, Entrée to Entrelac . I have also had designs published in a number of knitting magazines including Cast On, Knits and most recently Creative Knitting and Knitters. Teaching is what I consider to be my main business focus. When people ask what I do for a living, I say that I am a professional knitting instructor. Needless to say, that can be the start of some interesting conversations! I teach at most of the major knitting conventions, Stitches, TKGA and TNNA. I will also teach at various regional knitting gatherings, knitting guilds and local yarn shops. It is the part of the business that I love and if I could figure out how to do nothing else, I would teach exclusively. What would you like to tell knitters who are timid and do not believe they are skillful enough to knit some of your designs? My Skill Builder pattern line (www.knitability.com/knitting-patterns.html) is designed specifically for this type of knitter. Instead of listing skill levels, I list the specific skills I expect you have before starting the pattern and the skills you will learn by working through the pattern. As such, these patterns also include detailed pictures and descriptions of the techniques to be learned. It is just another example of the teacher coming out in me. Most of 2011 will be focused on promoting the new book. I already have a pretty full teaching schedule with venues throughout the country. Toward the end of the year, my blogging partner, Kellie Nuss and I will be leading a knitting cruise through the Panama Canal. This will be the second cruise that I have hosted and I am really looking forward to it. Because there are two of us, we are able to offer some classes that just do not work in a traditional class environment. We are also offering classes for teachers to improve their skills as well as classes on other fiber related topics. If people are interested in finding out more information, they can visit our blog – Two Sides of the Same Stitch at www.thesamestitch.com. Almost all of my designs of late have been focused on entrelac (for obvious reasons). I will have two new entrelac designs one each published in the upcoming spring issues for Creative Knitting and Interweave Knits. I have also been working on some entrelac gloves that may get published in a magazine or I may publish through Knitability. My next goal is to start thinking about non-entrelac designs and to add several new offerings to my Knitability line. Variety keeps life interesting, so I am often trying and doing different things. Before I started Knitability, I fully utilized my computer science degree as a consultant and as VP of IT operations for a competitive local phone company. Completely different work, but I loved that career too. Although I don’t really need more to do, right now I am also a part-time ski instructor at my local ski resort (2-hour commute), China Peak. Teaching skiing is a bit like teaching knitting as both a manual skills. I find I transfer teaching skills between the two venues. I only wish ski season and knitting season did not have so much overlap so I could spend more time at both. Whatever I am doing, I try to do my very best and enjoy the process, hopefully it shows! FG: Gwen, thank you very much for your appearance at my studio. I love your book and I hope our readers will check it out. I also wanted to thank you one more time for a great class I took from you. You are a fantastic teacher!